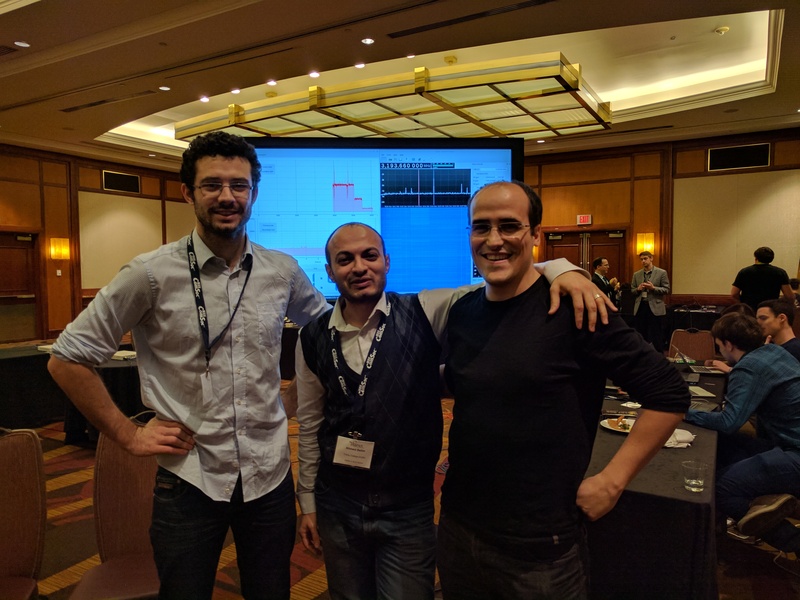 Justin Tallon, Ahmed Selim and Francisco Paisana. A team from CONNECT at Trinity College Dublin has won the Spectrum Challenge competition at IEEE DySPAN taking place in Baltimore in the United States. The Spectrum Sharing Challenge is designed to demonstrate a radio protocol that can achieve high spectral efficiency in a dynamic environment. The CONNECT team was composed of: Francisco Paisana, Ahmed Selim, Andre Puschmann, Christian Blümm, Justin Tallon, Pedro Alvarez, and Maicon Kist. Their contribution was entitled ‘Context-Aware Cognitive Radio using Deep Learning’. The CONNECT contribution drew on research work performed as part of Wishful (Wireless Software and Hardware platforms for Flexible and Unified radio and network controL), a Horizon 2020 funded project led at Trinity College by Prof Luiz DaSiva, and the deep learning research work of Dr Ahmed Selim. The team would like to thank Prof. Max Ammann‘s CONNECT research group at DIT and, in particular, Adam Narbudowicz, for the support provided in building the antennas used during the challenge. Read more about the Spectrum Challenge here.